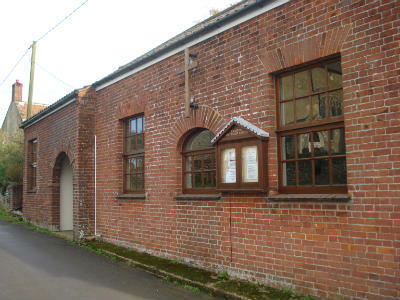 Please note that the fellowship of this chapel took the brave decision to cease worshipping there from 10 January 2016 and have mostly joined the community at North Walsham. Others worship at Mundesley and Trunch is within a few miles radius. January 10th, 2015 at 4 p.m.
Of all the many privileges bestowed on me as a Methodist Minister I count being asked to preach this afternoon as one of the greatest and I am both grateful and humbled to be here as together we share in the sadness and the thankfulness of this occasion. But at first glance it seems a strange day to hold such a service – a new year, so soon after Christmas and the birth of a baby, a time when we are coming out of winter and already looking forward to the new life of springtime and this Sunday which the Christian Church marks the baptism of Jesus and the start of his ministry. Everything around us cries beginnings, beginnings, but isn’t today all about endings? To which of course the answer is both ‘yes’ and ‘no’. Yes it is about endings and whilst many people are here today to say thank you and well done for 125 years of faithful worship and witness in this village; and it’s never a bad thing to remind ourselves that for every church that closes another 20 are opening throughout the world, for you nevertheless this is the end of a chapter and it’s not surprising there are tears in the eye and a lump in the throat as you bid farewell to a building that has become your spiritual home and remember those you have journeyed alongside, some of whom are now in heaven, and the special memories that are a part of this church’s history – and yours. So I know that all who have come to join you this afternoon will be praying for you in the coming days as you say goodbye and travel on. And yet today is about beginnings too and a continuing tale for whilst one chapter may be coming to an end it’s not the final one – no not by a long chalk- and it’s never wise to leave a book unfinished for who knows how the story may unfold? Like you I can only guess but I think I can read the next few pages. It is of a congregation who although sad just now will continue on their journey of faith, and freed from their responsibilities to open this, count that, or organise the other, will discover again the joy of knowing God afresh as they worship and serve him elsewhere. It is of a church whose members will enrich any church they join for their faith has not been in the bricks and mortar of this place but in Jesus Christ the head and cornerstone. So hanging in the schoolroom for the past couple of years has been a banner and you may just be able to make out the words on the order of service that you have in front of you: ‘Our Family - a circle of strength, founded on faith, joined by love, kept by God, room for all.’ And that is precisely what the members of this church have been to one another and will bring to any other fellowship they become a part of. So welcome them with gladness for you will surely be blessed by them. 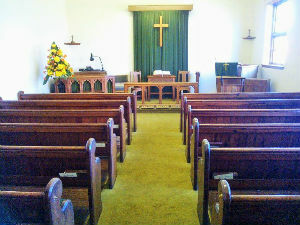 And then on the next few pages of the book I can read of charities, churches and this village community who will benefit from gifts of various kinds from this chapel and they will be a living witness to the love of God and of our need to care for one another that has been exemplified in this place. But as for the next chapter and the one that follows and the one that comes after that I cannot know now and neither can you because they are the pages of people whose lives have been touched and changed by God as a result of this place – preachers who have gone from here with the good news of the gospel, money that has gone from here to support so many projects and not least the work of Action for Children. Or those who have come here: - a lady in deep distress who found hope again because someone listened, a young man contemplating suicide who was loved and valued and began to turn his life around again, four young people whose call to serve God was confirmed here and who are in the ministry or on the mission field and many others who committed their lives to Christ. And four Presidents of the Methodist Conference, a Minister of the largest Methodist Church in London, two Chairs of Methodist Districts, and an Anglican priest in training, all who came here supposing they had much to bring only to discover that it was they who were receiving and each one (and I am one) would want to speak today of the welcome, love, prayer and peace that enriched them here and sustained them as they went on their way to serve God in other places. And I can tell you these stories – and you could tell countless more – but what none of us can know is the sequels to the story and what impact for good and for God has resulted- but you can be absolutely sure that it has. Some of you will have heard of Pauline Webb – a broadcaster, writer, missionary, a former Moderator of the World Council of Churches and a Vice President of the Methodist Conference as far back as 1965, and now nearly 90. A number of years ago, Pauline was invited to shake hands with those who had recently been ordained as Ministers and as she did so she told them that her hand had once held her father’s hand and he had once shaken hands with a man who had shaken hands with John Wesley! And that she said was the nearest Methodists get to apostolic succession! But apostolic or not, there is glorious succession of women and men who whilst probably never having heard of Knapton Methodist Church, have cause to praise God for those who have, and in this place have resolved to know Christ and to make him known. So listen to what Peter says in our reading that it is because of the new beginning that God has made when he raised Jesus from the dead that we have a living hope – an inheritance that can never perish, spoil or fade, kept in heaven for you. In other words, that what is unknown to us is already lodged in God’s memory bank and one day when the last chapter of the book has been written and its pages read aloud, and you see the end from the beginning, then and only then will you realise how wonderful the story really has been and be so thankful that you were a part of it. About 135 people aged between 14 and 80+ were present. and a Methodist Chapel since 1890.